“My all time favorite is chili crab with deep-fried mantou, what’s yours?” I asked on twitter. Everyone replied enthusiastically, the popular choices are pepper crab, chili crab, crab bee hoon, salted egg yoke crab and butter crab. Even though I just had chili crab and double baked cheese crab at Palm Beach Seafood recently, I find myself craving for the thick, sweet-and-spicy gravy of the chili crab, with deep fried mantou of course. While we are at the topic of crab, I realize people like to debate on which restaurant has the best crab in Singapore. Like what I always say: whichever place you like – has the best crab! And ONE entry per person, you are encouraged to get your friends to join the contest but please play fair and do not post multiple comments under different names. Please use a valid & contactable email when you post the comment. I will email the winners shortly after the contest ended, remember to check your email on Monday. 3. And the Four lucky Winners . . . The four lucky winners will be decided by a highly sophisticated method, and I reserve the right to re-pick if there’s any discrepancy or foul-play involved. I know there are folks from the States, Malaysia, Australia, and other countries reading my blog, but unfortunately this contest is only open to those currently residing in Singapore. But all of you are welcome to share your thoughts too! The closing date for this giveaway is Sunday 28th of Feb 2359 hrs, and so you have exactly forty eight hours before it ends. I hope you enjoy the little gift I have for everyone! My all-time favourite is the good ole Chilli Crab — it’s spicy, and I grew up eating it so it’s got lots of sentimental memories attached to the dish. Hope I get to eat some at Palm Beach! Steamed crab – because that’s when you taste the true freshness and sweetness of the crab! 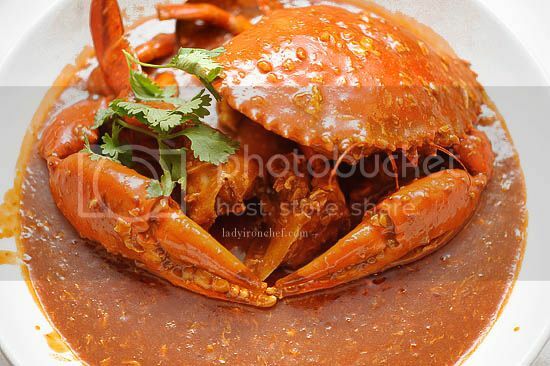 Because with chili crab theres so much gravy that you cant tell if the crab is rotten or not. It’s very easy to cook with very minimum ingredients.But still deliciously wonderful. As easy as…ABC Butter Pepper Crabs. Garlic 2 or 3 chopped. 2-3 tbs butter or margarine. Melt butter in wok,add garlic,add crab stir once or twice,add pepper stir,add very little water stir cover the wok for few minutes. Open the lid add few drops of corn starch,salt,little sugar to taste stir. Add some garnish it ready to eat. Wow, I’ve been craving crabs for a week, so this comes at an opportune time! I’m a fan for just about all kinds of crab, but I think butter crab is just heavenly. It’s as sinful as it is good. how the black pepper and crab “combined” gives a spicy + shiok feeling! and the licking of the crabs with the black pepper on top of it is just YUMMMS. but i like the mantou served with chilli crabs too… so i kinda have a dilemnia all the time. The only way to taste the original flavour of the crabs. i love kam heong style crabs. that amazing way the ingredients : hae bee, garlic, shallots, curry powder and leaves with chilli padi come together to create a finger licking good sauce. chilli crabs. for the sauce to dip those tiny one bite mantous into. loving chilli crabs. i dont eat the crab. i just want the sauce to drown my rice and mantous in. STEAM!!!! some even steam with shaoxing wine & egg white… oooooo…. yummy….. need some crabs now and no craps! I love Crab cooked with fried vermicelli. Love it because the vermicelli soaks up the broth in which the crab was cooked in. Then both the vermicelli and the crab are heated up in a claypot till the vermicelli dries up till it’s nicely dry yet soft. Yummy… The crab has the taste of the broth and the vermicelli was deliciously tasty and chewy! This is how my mom normally cooks our crab back home in Manila. Btw, I am a Filipino Chinese, hence the dish is still Chinese inspired in taste. First, she deep fried the crabs in flour with some seasonings on it. After which, she uses oyster sauce to use as a sauce base covering the crabs. Putting some chili (sili labuyo) to the sauce does wonder. A tinge of spiciness should come through the dish. A dish which is sweet, salty and spicy is a great combination to a wonderful meal. The sauce will stick to the flour coating of the crab making it more tasty. Add some sesame oil. Chilli crab is da BOMB! Mantou is also the must have with it! definitely chilli crab. you can eat it on its own or with the fried mantou. either way, it’s yums!!! I LOVE Chilli Crab! especially for the one that has crab eggs!! the mantou gives additional touch to it. this ‘gold plated’ dish has the sweetness of crab infused with the zesty taste of the golden egg yolks, especially if the crabs have roe. the taste of salted egg yolk with crab roe dancing in your mouth is absolutely heavenly. definitely ‘gold rated’! I adore a perfectly fresh steamed crab. The taste of the pure sweetness of the crab meat, which I sometimes lightly dip in a vinegar-soy sauce dip, is exquisite. Sometimes, it’s the simple things in life that truly matter. Chilli Crab!! thickness of the sauce, smoothness of the eggs, freshness of the crab in total harmony. Mouth-watering pungent yet gentle dish~ Best to eat it with your hands! Slurp! I used to only love eating Chilli crabs especially all the gravy + roe, of course with mantous too! But, I’ve got a new-found love – Black Pepper Crabs! For the very first time I tried yesterday & voila! It was love at first taste! I like it as there isn’t much gravy to it, love the tinge of spicyness. I love the crab bee hoon soup at Melben AMK! I love the milky soup (yum! )as well as the dig out delicious crab meat in the dish. Nv tried crab before in my life cause I’m a utensils person but if there’s crab dish which will get my hands dirty and drooling at the sight of it, it would be an imaginative never yet created nor seen before Black Pepper Crab Claws, Chilli Crab Meat(main composition of the crab’s body) and other variations of the cooking but different parts of the crab all served in one dish with freshly steamed pandan & plain mantous for accompaniments. I like mine a variety!! Chilli crabs will be my favourite! I am pretty old skool and there is nothing wrong with that. And I love the fried buns! Very filling but it does mop up all the sauce. My favourite is definitely …. chilli crabs. YUM! My favourite style of cooking crab is steamed! Especially with the hot gravy sauce… fresh and sweet! yummy! and of course the sauce with fried bun! Tried it once from Seafood Paradise. Hasn’t tired this from anywhere else coz the usually crab dishes are Chillicrabs.. I like chilli crab because I like to eat the yummy gravy with bread! Chilli crabs with hot crispy man tous beat everything else hands down. I just love dipping fresh crab meat into the egg filled sauce, then tasting the sweet and spicy flavour of it all, coupled with the juicy crab meat. Mmmmm it is really one of the greatest dish ever invented! Hello all, thank you for participating. The Palm Beach seafood giveaway is now closed. I will choose the winners tomorrow, remember to check your email! Down to earth Singaporean seafood (read pepper / chilli crabs & all manner of shellfish and fish) in a fantastic city waterfront setting. You eat outdoors (or indoors if you have to) with the Merlion in front of you with the Marina, and the Singapore CBD skyline gleaming behind you. Despite the slick setting, the food is authentic and the restaurant relocated from Ponggol a few years ago. The easy way to enjoy a giant Sri Lankan crab cooked in black pepper sauce.